To prepare the SodaStream Lemonade: Fill a Sodastream 1 Litre Bottle with cold water and carbonate. Slowly add a capful of SodaStream’s Classic Lemonade Sparkling Drink Mix. Combine by gently shaking. Preheat the oven to 200°C. Place the flour and salt in a large bowl. Cube the cold butter and add to the flour and salt mix. Use your fingers to rub butter into the mix until it resembles a rough breadcrumb. Add the cream and the SodaStream Classics Lemonade. Mix until a soft dough forms, then knead lightly until combined. Press the dough flat to around 2cm in thickness. 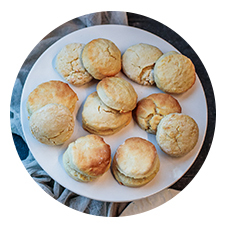 Use a round cutter to cut out 8 scones and then place them on a baking tray. 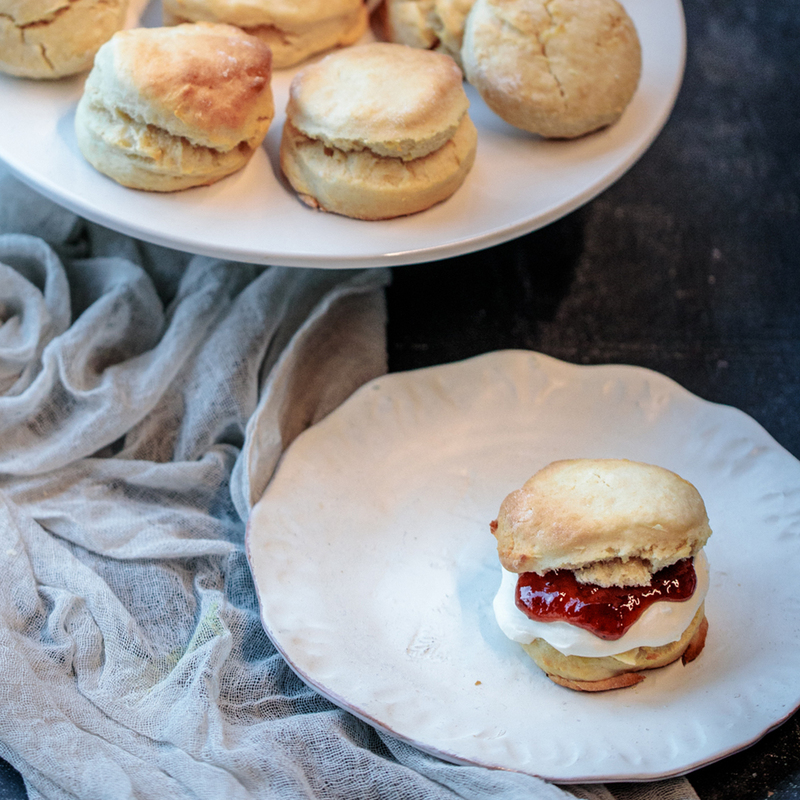 Serve warm, with jam and whipped cream. Preheat oven to 180°C. Butter and then line the base of two 20cm spring-form cake tins with baking paper. Using an electric blender, cream the butter and sugar together until pale and smooth. Crack the eggs in one at a time and blend until the mixture is well combined, scraping down the sides of the bowl after each egg is added. Bake both tins in the centre of the oven for 25-30 minutes, or until a skewer inserted into the middle of each cake comes out clean. Remove from oven and allow to cool for 10 minutes. Remove the cakes from their tins and leave to cool completely on a wire rack. Using a long bladed serrated knife cut the top off one of the cakes to make it flat. Place that as the base layer of the cake. 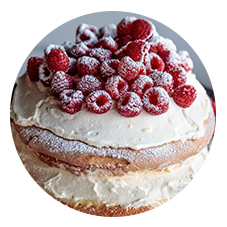 Spread an even layer of whipped cream over the top, then layer on the other sponge cake. 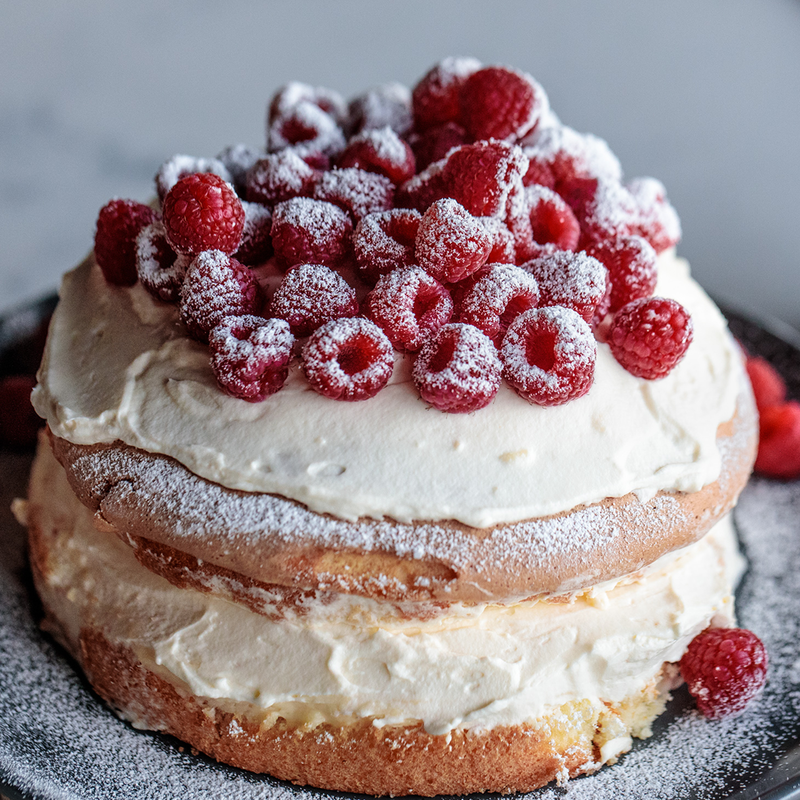 Finish with some more whipped cream, a scattering of raspberries and a dusting of icing sugar. Crack eggs in to a medium bowl. Add turmeric, garam masala and salt. Whisk with a balloon whisk until pale and creamy. Add the egg mixture to the onion mixture in the pan. Using a wooden spatula, draw the egg from the edges to the centre of the pan in a cutting motion. Cook for a minute or two until eggs are just cooked and still wobbly. Preheat oven to 180 degrees. In a large bowl, with an electric mixer on medium, beat the butter and sugar for 3 mins. Add the egg, SodaStream Orange Flavour, honey and beat for 2 minutes. Add the sweet potato, evaporated milk, vanilla, salt, cinnamon and nutmeg and combine. Pour the sweet potato mixture into the crust. Bake until the filling is set around 50-60mins. Let cool for at least 30 mins and serve at room temperature. Add in eggs, vanilla, lemon zest and buttermilk and whisk until smooth. Add flour, baking powder, soda water and salt, and whisk just until combined. Stir in blueberries. Batter will be thick. Spoon batter into a large disposable piping bag or freezer bag (or spoon batter into the pan). Cut off the end of the bag so your opening is about ½-3/4” wide (big enough for the blueberries to get through). Pipe batter once around each donut hole – the batter shouldn’t quite fill the hole as they’ll expand and rise. In a medium bowl (not too deep as you’ll want to be able to dip your donuts), combine sugar, zest, and 6 tbsp of juice or milk. Add an additional 1-2 tbsp of liquid if needed. You want your glaze to be thin enough to evenly coat your donuts, but thick enough that it will set and become dry to the tough. When donuts are completely cool, dip tops of donuts into the glaze and overturn so the glaze runs down the sides. Set aside for the glaze to set. In a large bowl, add flour, almond flour, salt, sugar and butter. Use your fingers and work the butter into the flour. The result should be a crumbly mixture. Add the water a little at a time and work quickly together until it forms a dough. Press the pastry dough into a 10 inch large greased tart tin and chill in the refrigerator for 1 hour. Prick the bottom with a fork. Bake in 190C oven for about 15 minutes or until golden. Cool on a wire rack. In a saucepan heat up rhubarb and sugar, cook until the rhubarb start to soften. Stir in the strawberries. Fill the crust with the mixture and serve while warm with ice cream and enjoy with a glass of sparkling water! Step 1:Combine the flour, oats, baking powder, salt and sugar in a large bowl. Whisk in the eggs and add sparkling water until combined. Step 2:Scoop a spoonful of batter into a frying pan, carefully. Cook hotcakes until bubbles begin to form around the edges. Flip with a spatula and cook until golden brown. Step 3:Enjoy with a topping of banana and honey or maple syrup! Preheat oven to 175C with rack in middle. Grease the side and the bottom of a 9 x 3 inch spring form pan with butter or cooking spray. Line the pan with baking paper. Pour into moulds, top with sparkling water, add sticks and freeze. Sift flour, baking powder, and baking soda together into a medium bowl. In a separate bowl, beat butter, sugar, and 2 eggs until very light in color and fluffy, 2-3 minutes on high speed. Add vanilla and Greek yoghurt and continue beating until very creamy and light in color, for about 1 more minute. On low speed, mix in the flour until combined. Do not over mix. Transfer the cake batter to the spring form pan. Top with sliced peaches and blueberries and sprinkle with granulated sugar. Bake for about 1 hour, until cake turns golden and the tester comes out clean. (If you want and have extra time, midway through baking, add extra peach slices and blueberries for more bursts of flavours!). When it's done, let cool on a wire rack for about 40 minutes then serve on a plate with a glass of sparkling water! Prepare the rockmelon: hollow out half a rockmelon and put aside. In a large serving bowl, combine the fruit together then add the fruit combination to the rockmelon half. Mix the white wine and Sparkling Water, then pour over fruit and serve. Tip: fruit from the fridge adds extra freshness. Prepare sparkling water: Fizz 1L of cold fresh water and combine with FRUITS Berry Mix flavour. Mix well. Place lime and raspberries in glass and muddle. Top with diced dragon fruit and ice. Slowly add 400ml Berry Mix flavoured sparkling water. Garnish with lime wheel, serve and enjoy! Heat the vegetable oil into a saucepan, dip the prawns into the batter and fry for 2-3 minutes, or until golden-brown and crisp. Remove with a slotted spoon and drain on kitchen paper. Cook the rice noodles in boiling water according to packet instructions, then drain and refresh under cold running water. Transfer to a bowl, stir in the soy sauce, sesame oil, sesame seeds and coriander. Season, to taste, with salt and freshly ground black pepper. Pile the noodle salad onto a serving plate and top with the deep-fried prawns. Garnish with lime wedges and give yourself a pat on the back! Enjoy! Mix together 120g of the cornflour and the sparkling water to make a batter. Season the remaining cornflour with salt and pepper. Dust the squid in the seasoned cornflour and then dip in the batter. Fry in small batches until golden and crisp. Add the chili for the last few seconds. Drain on kitchen paper and serve with lime wedges, fried red chili and seasoning! Enjoy!